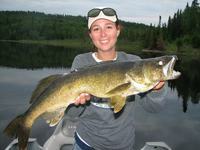 Plan your next Canadian fishing trip with the help of the experts at ResortsandLodges.com. When you're looking for the opportunity to reel in your limit of trophy-sized musky, northern pike, walleye, large- and smallmouth bass, and a wide variety of panfish, you can start and end your search in Northern Ontario. The region offers a seemingly endless list of resorts and fishing lodges that have everything you need for a successful fishing trip with friends and family. Start planning your own adventure with or selection of some of the area's top properties! Wilderness Air Escapes' access to more than 20 nearby lakes means that it specializes in ma angler dreams come true! Listen to the tiny "plunk' of your cast hitting the water a fair distance away. The peaceful echo odd a loon punctuates the silence. This is just a casual evening out on the lake at Wilderness Air! 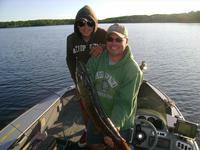 All manner of fish can be caught here, including northern pike, muskie, smallmouth bass, trout, perch, and walleye. Spend the day out on one of the two dozen surrounding lakes, then return to the lodge for some great accommodations and superior hospitality. Get cozy in one of the multiple cabins or try your hand at some camping- we're sure that you’ll never forget sleeping under an infinite blanket of stars. Come see for yourself! Wilderness Air Escapes is proud to exclusively present 15 catch and release lakes and 18 conservation lakes. Wilderness Air Escapes has exclusive rights to eleven fly-in outposts that will take your breath away. For fantastic trophy fishing, superb hospitality, and scrumptious dining, there's one lodge that stands above all the others: Manotak! Veterans and beginners alike flock from all over the world to experience Northern Ontario's incredible fishing scene, and Manotak is a premier place to stay while doing so. Walleye, Northern Pike, Smallmouth Bass, Whitefish, Perch and Muskie can all be caught in the surrounding lakes. Of note, Perrault Lake is over 50 miles of shoreline, plenty of room for you to land "the big one". Ask the front desk about the lake's hot spots, plus what lures and rigging you should be using, and they'll happily accommodate you. Forget to get a fishing license? Never fear: fishing licenses are available to purchase at the lodge. Add that to the lodge's luxury accommodations, and it adds up to a fisherman's paradise! The resort's modern guest cottages can accommodate two to twelve guests each. The fishing season begins in mid-May, when the ice melts! Do you dream of spending the whole day on a lake without ever seeing another boat? Dream no more- live it at Brennan Harbour Resort! Set against the looming majesty of Lake Ontario, an average fisherman could be a little intimidated. But all it takes is a chat with the knowledgable fishing experts at Brennan Harbour, and you'll have the confidence to conquer the abyss! Inside the dark waters lurk walleye, northern pike, smallmouth bass and jumbo perch, among others, all waiting to be caught and shown off to your friends at home! Meanwhile, the accommodations and amenities of Brennan are spectacular in their own right- combine them with the fishing and you have a can't-miss destination! 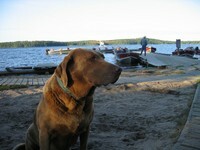 The resort is 3.7 km from the Trans-Canada Highway and 23 km from Canoe Lake. There's a community lodge with satellite TV, Wi-Fi and a selection of books and games. For your next Canadian fishing trip, head to Dogtooth Lake and scratch an itch you never knew you had- the primal desire to catch a fish with your wits, skill, and advanced equipment! There are few places where you can do that as easily as Dogtooth. Nestled among the quiet woods of Ontario, Dogtooth Lake Resort is stupendous for the aspiring fisherman! 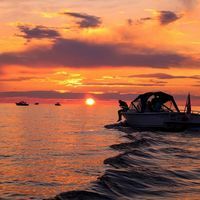 Lake Ontario is, obvious, well-known for its size and fishing scene, and Dogtooth provides a variety of conveniences and services to make a fisherman's life easy. The onsight store has gas, oil, ice, live bait, lake maps, tackle and fishing licenses, while there is also a fish house equipped for filleting and wrapping your catch for the freezer. Add that to Dogtooth's spectacular accommodations and hospitality, and you've got a winner! The best time of year to come to Ontario for fishing is January 1 through September when you'll have the greatest number of seasons open with different species of fish. Dogtooth Lake Resort also offers an option for those groups seeking some privacy. The resort hosts one outpost camp located on a separate island on Dogtooth Lake. It accommodates any size group and is totally remote. At Clark's you'll experience Ontario’s rugged wilderness, breathtaking views, and hospitality like nowhere else! Clark's Resorts & Outposts encompasses 20+ remote Fly-In Outpost locations, each with its own unique charms, natural beauty, and fantastic fishing opportunities. That begins with their army of well-maintained 17-foot boats choose your craft, inside of which you'll find landing nets, minnow buckets, paddles, mid-week camp checks, ice, water, and live minnows. Land some of the biggest fish in the lake- as most of the cabins are the only ones on the entire lake, privacy won't be an issue! Instead, you'll be treated to the sweet sounds of pure natural tranquility. The owners stop in and check on guests every second or third day and of course, supply them with fresh minnows and ice at no extra charge! Just let them know what type of vacation you are looking for and what type of fishing you prefer, and the staff can recommend a destination that suits your needs! The hidden gem of the French River, Wolseley Lodge is a rare hybrid of luxury and country-charm that has to be seen to be believed! Whether you're standing on the dock, in the shallows, or on a boat, the fishing at Wolseley is simply to incredible to pass up. The list of fish here reads like a something out of every fisherman's dreams: Walleye, Muskie, Northern Pike, Small Mouth Bass, Large Mouth Bass, Perch, Sunfish and Rock Bass all call this part of the river home. Meanwhile, the surrounding large bays, small islands and white-water rapids also make for a stunning backdrop, and the lodge's 16 comfy cabins are the perfect place from which to enjoy it. What are you waiting for? Get over to Wolseley Lodge right now! The lodge is 12.4 km from Route 64 and 31.8 km from the Trans-Canada Highway. There are fishing boat and pontoon rentals, plus boat moorage. 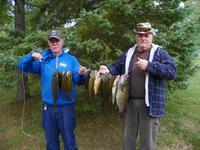 Incredible fishing abounds at Elk Lake Wilderness Resort, whether you're a veteran or a rookie! Cast off from shore and cast away- Elk Lake's 41 kilometers of navigable waterway are home to a cornucopia of spectacular fish. 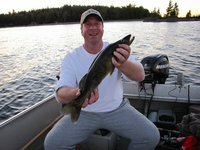 Walleye (pickerel), Northern Pike, Bass, and Perch abound in this section of the Montreal River- access them via your own boat or rent one of the resort's quality boat and motor packages. Once you've caught your fill, head over to the dedicated fish cleaning hut, after which you can eat it right away or the resort will store it for you to take home. The scenery is, of course, unforgettable, as is the hospitality. What are you waiting for?! After dinner, relax in the wood-fired sauna! Rent a canoe, kayak, peddle boat, or swim out to our water bouncer - both kids and adults love it! The magnificent Canadian Shield is one of North America's most spectacular places, with thousands of crystal clear freshwater lakes created by an ancient glacier- let's just say it makes for some spectacular angling, especially at Rough Rock Lodge & Outpost! Surrounded by the sheer beauty of rock cliffs and colorful ever-changing scenery, a day fishing at Rough Rock truly makes you appreciate all that mother nature has to offer. Grab a boat and cast away for Walleye, Smallmouth Bass, Northern Pike, and Muskie to your heart's content! This one-of-a-kind Canadian fishing outpost lodge is the perfect place for a weekend fishing getaway! Guide will also prepare a fresh shore lunch or pack a lunch! One of the most unique aspects of Rough Rock is that anglers can fish after dinner, an option most Canadian fishing resorts don’t offer! For those seeking a true fishing experience, Maynard Lake Lodge and Outpost offers pristine vistas, immaculate accommodations, and, of course, stupendous sport! Located on a prime position on the esteemed English River System, Maynard is accessible only by float plane. Tranquility in here in spades, but here guests get more than JUST that. Maynard five-star resort is the only one on the lake, and its unspoiled waters provide incredible opportunities for some of the best fishing in the country. Whether you're in search of walleye, muskie, northern pike, or smallmouth bass, the lodge has an abundance of them all. Fish as much or as little as you like- there's no pressure here! 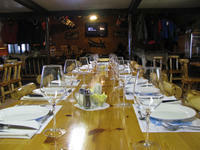 Maynard Lake Lodge also offers great corporate packages, if you want to mix work and play! 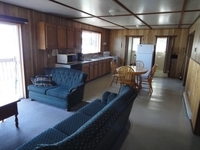 There can be up to 32 guests in total comfort at Maynard Lake Lodge! 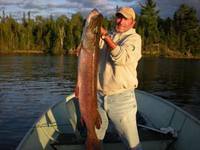 Maynard is the only fishing lodge on an over 8,000 acre section of the English River System. For some of the best fishing in the world and a spectacularly serene environment to do it in, look no further than Zup's! Majestic Lac La Croix is home to a number of things- no public road access, 35 miles of water, and only two lodges, one of which is Zup's. This tranquil isolation gives the Lake immense serenity and opportunities for superb angling. Head out on a Zup's boat either alone or with guide and cast away. Who knows what could happen? Fight a smallmouth bass on top water, accidentally hook a massive Northern Pike, or catch the Muskie of your dreams- it's all possible at Zup's Fishing Resort and Canoe Outfitters! Three homecooked meals per day are served in the lakeside dining room. Hats adorn the walls of the lounge area dating back as far as 1965, the opening year of the lodge. Comfortable rocking chairs by the beautiful stone fireplace invite you to an evening of fishing tales or roasting marshmallows for s'mores! The lake at Tetu is filled to the brim with monster pikes, jumbo smallies, humongous muskies, and the kind of walleyes you’ve only dreamed of catching. What more could you want from an Ontario fishing vacation? But just exactly HOW did the fish at Tetu get so big? Tetu Island practices catch and release, keeping the medium to small fish but releasing the biggest so to make the population only grow more! Grab one of the Lodge's boats- which range from small skimmers to a new 18.5-foot Alumacraft boat with 90 HP Yamaha motors- and cast away! Each of the roomy, comfortable crafts feature wide casting decks and are conditioned perfectly for our demanding style of fishing. Just sit back, relax, and let the fish come to you! Finally, don't worry about spending countless days buying and organizing all your equipment- at Tetu Island Lodge, the friendly guides will provide every rig and lure you could possibly imagine! Guests are so pleased when they come here, 90% of them come back. If that doesn't speak to the resort's quality, we're not sure what it does! The over 50 miles of gorgeous Perrault Lake shoreline surrounds an anglers paradise, and Rainbow Point Lodge is the ideal place to experience it! As one of the premier fishing lakes in Northern Ontario Sunset Country, Perrault draws fishermen from all over the world, eager to experience its signature kind of angling. There are countless fishing spots to try, whether you're on the dock or taking out one of Rainbow Point's numerous boats in their fleet. There's no telling what you might find: Smallmouth Bass, Northern Pike, Walleye, Perch, Musky, Crappie, and even Whitefish can be caught at various times of year. Upon arrival at the lodge, the owners will go over a detailed Perrault Lake contour map with you. You'll get all the newest information so your expedition will be as successful (and fruitful) as possible! Hunters can combine their hunting with a fishing package for the ultimate experience. Your hosts, Bob and Gale, have proudly offered anglers great fishing opportunities for both trophy and table class fish on Perrault Lake, for more than 30 years. Nestled within the prestigious 30,000 Islands of Georgian Bay is somewhere... nice. You might even say it's pleasant! Pleasant Cove Resort is the ideal way to fish Pointe au Baril! This hidden gem is one of the best fresh water boating and fishing locations in the world, combining rugged natural beauty, stupendous hospitality, and. of course, incomparable fishing. Surrounding the resort you'll find trophy Pike, Walleye, Musky, Large and Smallmouth Bass in abundance. Whether you're here for a weekend of solace or with your extended family, you'll find your happy place. There's a reason why Ontario Out of Doors Magazine calls Pleasant Cove "Some of your greatest fishing right at your backdoor"- it's can't miss! Amenities include an outdoor pool, a hot tub, a sauna and a whirlpool bath, plus arts and crafts for kids. The resort is 2.2 km from the Trans-Canada Highway and 6.6 km from Sturgeon Bay Provincial Park. Located on beautiful Lake of the Woods, Harris Hill Resort draws aspiring fisherpeople like moths to a flame! There's an insane amount of fish just waiting to be caught inside gorgeous Lake of the Woods. These include, but are not limited to, Walleye, Sauger, Smallmouth Bass, Crappie, Northern Pike, Musky, and even Perch. The friendly staff will be more than happy to show you the lake's "hot spots" where the fish are always biting, or you could hire a guide for more intensive instruction. The lodge itself is near a host of islands, shoals, weedy flats and other structures- some of the best trophy fishing that Ontario has to offer can be found right here! Each Lakeview Housekeeping cottage has a private deck, picnic table, firepit and wood for a nightly bonfire. Harris Hill Resort is a renowned area for birders, with 302 known species in the Rainy River Area. The remoteness and tranquility of Red Pine Wilderness Lodge is ideal for fishing, relaxing, and simply appreciating Mother Nature's beauty! There is no road access to Red Pine; instead of traffic or the smog of automobiles you'll listen to birds chirping and breath crystal clean air. The comically huge surrounding area is roughly 22,000 acres when added to Sucker Gut and Willow Island Lakes. Red Pine itself is located on the northeast arm of the lake, and is adjacent to many sheltered fishing areas (with water depths in the 15' to 40' range). 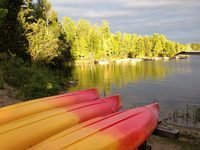 It's a testament to the area's excellence that large as Lady Evelyn Lake is, most guests stay within a three mile radius of Red Pine Island for their fishing excursions! Guests are met at Mowat's Landing (west end of Hwy #558) at either 10am or 2pm on Saturdays. The following 15 minutes is spent crossing the Montreal River on a barge. From Detroit - Hwy #401 East to Toronto area, use the new Hwy. 407 (ETR) Express Toll Route across the top of Toronto to Hwy #400 North, continue on Hwy #11 North, through city of North Bay. Make sure you go right on Hwy #11 at the top of a hill when leaving North Bay then approx. 100 miles further north to Hwy #558 West, 12 miles to Mowat's Landing. Hop aboard the ferry and embark on the short ride to Ballard's Black Island, an ominously-named yet naturally beautiful fishing destination! Set on a private island on Ontario’s Lake of the Woods, Ballard's provides a quiet yet accommodating retreat for all types of fishermen. There are one million acres of water and fourteen thousand islands on the lake- we're guessing that that is enough for most. Spend your days roaming sandy shorelines, fish protected waters, and cap it all off with an auburn sunset! Whether you’re jigging for Walleye or waiting patiently for an elusive Musky, your dream fish await at Ballard's Black Island. The resort has Boat-In only access, so you probably can't drive there! Fishing on Lake of the Woods is as good as it gets. Ultra-clear water, beautiful weather, and peaceful shores are just a few of its charms- but chief among them is Pipestone Point Resort! Miles of pristine shoreline, incredible hospitality, and superior accommodations - that's Pipestone in a nutshell. But even more than that, Pipestone is the destination of choice for avid fishermen the world over. Lake of the Woods, with its many grassy bays, is undoubtedly the most productive Muskie habitat in North America. Meanwhile, Northern and Walleyes abound in the many bays and nooks of the lake. After a long day of angling, head back to the Resort for some well-deserved R&R! Pipestone Point Resort has its own general store, live bait, a complete line of tackle, top of the line rods and reels, and a finely crafted selection of Muskie lures to tempt that trophy fish. Enjoy popcorn over a game of pool, listen to the tunes of the jukebox or play a few on the piano. Pipestone even features a big screen TV, cell phone service and wireless internet at the lodge. From the verdant greens of May to the vibrant palette of September, you'll find a fishing paradise at Stokes Bay Resort! It might be named Rainy Lake, but more often than not it's perfect weather for fishing! Stokes Bay Resort - Rainy Lake Outpost is geared towards the fishermen who want something affordable, yet luxurious. Thoses principles are evident throughout the accommodations. All are clean and comfortable- there are three new cabins that sleep 4-6 and one lakeside cabin that sleeps three. Of course, you're here for the fishing, and there's plenty of that! Northerns, Smallmouth Bass, Walleye, and Crappie... all are just waiting to be caught! Climb aboard, boating in is half the fun of getting here and if you are prepared properly you will have plenty room for beer! A twenty minute boat ride from camp will bring you to Hale Bay, Canadian Channel, Pound Net Bay and the Rat River Bay system. Cliff Lake Resorts' four types of accommodation give guests the freedom to stay how they want- but regardless you'll be having the time of your life! The over 200 miles of pristine shoreline surround Cliff Lake Resorts gives guests more than enough space to fish to their hearts' content! The Cliff Lake system features a plethora of species, including musky, northern, walleye, lake trout, smallmouth bass, whitefish and perch. Meanwhile, the resort's seclusion means that you'll never be hassled with crowds- it's just you, your party, and mother nature herself. If you live for the thrill of chasing BIG fish or just want to have a story to tell when you return home, let Cliff Lake Resorts show you what fishing is all about! Sitting on thousands of unspoiled acres of boreal forest located in the heart of prime black bear, moose and grouse country this is a true hunter’s paradise. Many of the food sources in Cliff help produce large size walleyes due to a forage base that is naturally more oily and fatty: such as, white fish, cisco, and lake trout. Resting on the shores of beautiful West Shiningtree Lake in the quiet town of Shining Tree, is peaceful Bay Wolf Camp, an ideal retreat for outdoor adventurers of all ages. This incredible destination welcomes the active traveler looking to escape the hustle and bustle of city life and bask in the refreshing surroundings of Mother Nature. Bay Wolf Camp provides all-inclusive fishing packages for anglers of all skill levels. Their premier location on the West Shiningtree Lake ensures you're never far from the action. Plus they offer fishing opportunities at 12 nearby lakes for even more chances to reel in a trophy catch. Teeming with walleye, northern pike, bass, crappie and much more, you're sure to have a successful trip! Hunting enthusiasts will discover Bay Wolf Camp to be the perfect place to enjoy an unforgettable hunting trip. Their premier location offers packages for both small game and black bear hunts so you can choose the adventure right for you. Bay Wolf Camp's all-inclusive rates include comfortable lodging, excellent equipment, and freezer service for whatever you catch. You'll be readily equipped with a motorboat, outboard gas and oil, boating accessories and bait. From glamping and hunting to ATVing and world-class fishing, Horwood Lake Lodge has a little something for every outdoor enthusiast! Horwood Lake Lodgeis located on beautiful Horwood Lake, a spectacular 14,000-acre body of water, often described as the prettiest lake in Northern Ontario. The lake is both spring and river fed and you will be overwhelmed by its picturesque shores with steep granite cliffs, its gently sloping wooded shorelines and its magnificent sandy beaches. The lake offers a variety of depths, structures, irregular shorelines and islands with numerous secret fishing holes awaiting your discovery. Snowmobiling, ice fishing, ATVing, snowshoeing and more can and should be done in the winter! Established in 1953, the Lodge sits on a peninsula that extends out into Hardiman Bay, on the eastern arm of beautiful Horwood Lake. This unforgettable Ontario camping destination combines spectacular surroundings and incredible fishing into one can't-miss package! Whitefish Bay Camp's easy access to beautiful Lake of the Woods makes it the perfect place to get some quality angling in, whether that be with family, friends, or coworkers. After getting cozy in your luxury accommodations, get outside and get to fishing! Grab a boat and sidle up close to mother nature, as you cast off into the bay's crystal clear waters. 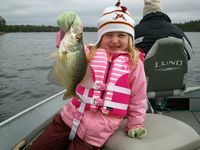 There are oodles of species to catch, including Muskie, Northern, Walleye, Smallmouth and Largemouth Bass, Lake Trout, Perch and Crappie (to name a few). The camp's secluded island location makes for a tranquil retreat for anyone that desires a little peace and quiet. Whatever you're looking for, you'll find it at Whitefish Bay Camp! Whitefish Bay Camp offers rifle, archery and muzzleloader hunts as well. Upon your arrival at the mainland dock site it takes only about 25 minutes by our comfortable pontoon launch to arrive at our camp. Only accessible by air, as you arrive at Moose Point Lodge you have a spectacular view of Shikag Lake, or as you'll come to know it: fishing paradise! Moose Point is surrounded by more than 130 miles of remote scenic shoreline. Beneath the blue waters lurk all manners of fish, just waiting to be caught by a savvy fisherperson such as yourself! This is truly one of the best places in the world for walleye, northern, and smallmouth bass, which are usually biting in large numbers. Meanwhile, the rustic log exterior of the lodge itself opens to a warm and comfortable setting that invites guests back after a day on the water or in the wilderness. It's nice to know that even if the weather doesn't cooperate you'll be having a fantastic time at Moose Point! For walleyes jigs tipped with minnows, leeches or nightcrawlers generally work best, though twister tails and crankbaits do have their moments. Smallmouth are caught with the same type of tackle as walleyes though crank baits and spinners are more productive.